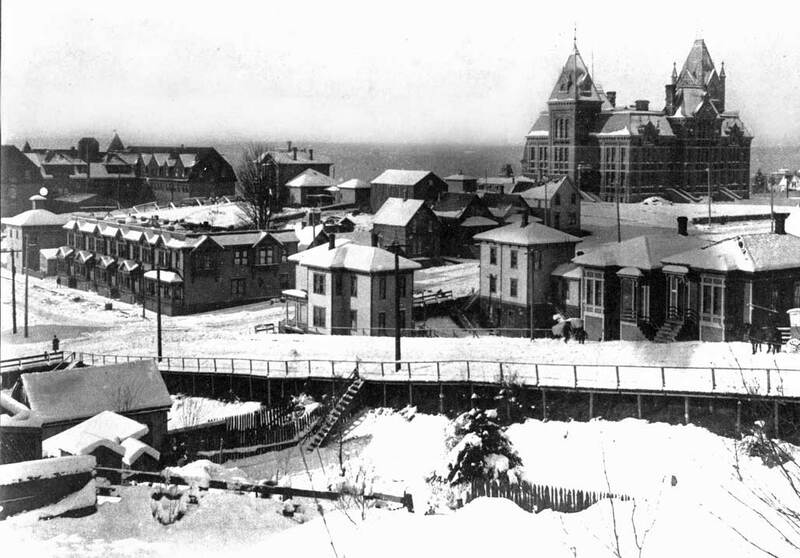 One of our most remarkable winter “episodes” arrived on Jan. 27, 1893. Except for one cold and clear break on Monday the thirtieth, it snowed until Feb.7. 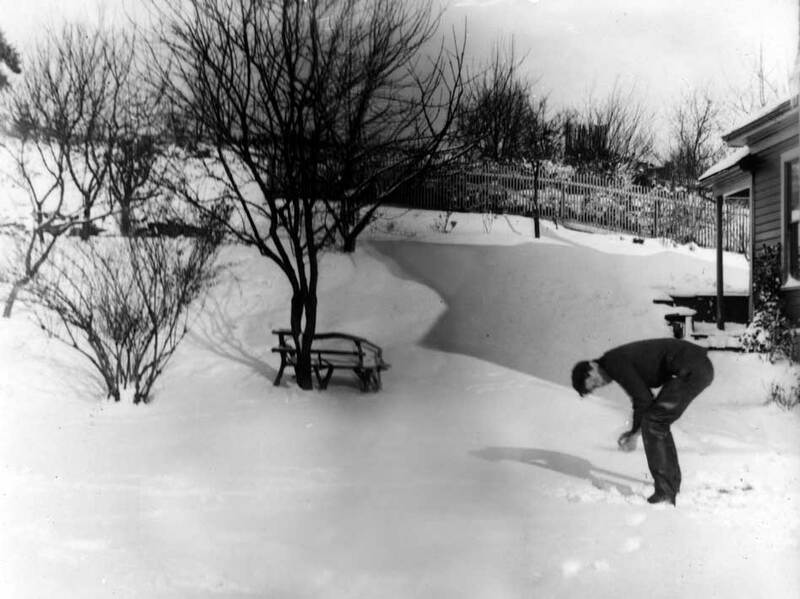 Although the snow was not as heavy as in 1880, still it accumulated 45 inches, and it was much colder. On the last day of January the thermometer dove to three above zero. The Press Times reported, “When the good people of Seattle came to get up this morning there was a weeping and wailing and gnashing of teeth. There was not a drop of water to be had. Everything was frozen up. The water pipes were tight as a drum. The only remedy was to melt snow. This was put on the stove by the gallon, and when reduced to water made about a teacupful. Water pitchers were cracked and people generally were in a bad way. 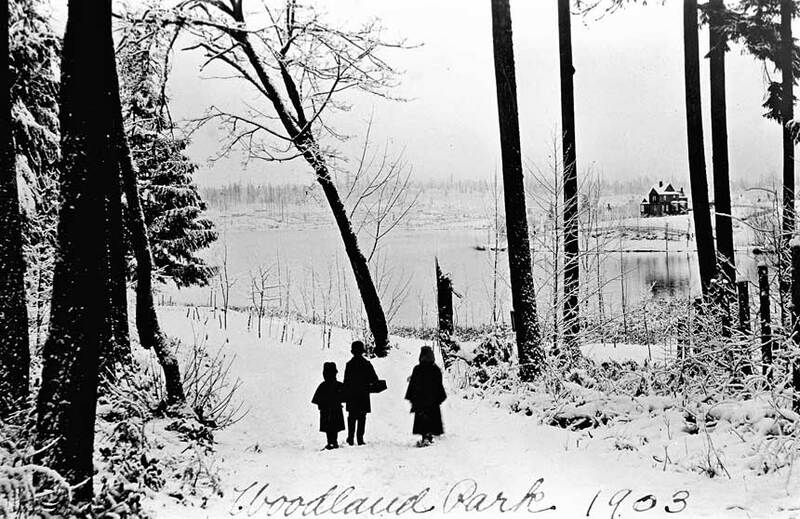 The man who said anything about the balmy weather of Puget Sound risked his life in so doing.” Another thermometer at Woodland Park, when it was still a suburban retreat for the Phinney family, showed a dip on Feb. 3 to 5 degrees below zero. By then the ice on Green Lake was six inches thick. With three feet of snow frozen in the streets the streetcars were stopped for days and horses were often helpless. The accompanying photograph looks northwest from 8th Avenue to Central School on the right, at Sixth and Madison, and the Rainier Hotel, far left, with its big back facing 6th Avenue. Columbia Street is on the right. 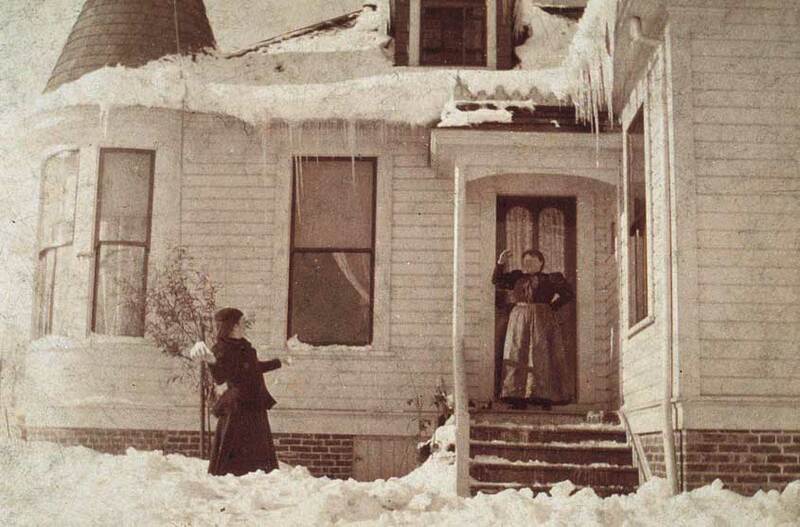 The photograph is not dated, but its “internal evidences” puts it in the early 1890s and may be a recording of the 1893 snow during its dwindling denouement. Or as likely it is witness to the accumulation in 1896. The thermometer reached 12 degrees on Feb. 5, and through the winter 37 inches of snow fell. It seemed like a lot at the time, unless you had been living here in 1893 and the many who had been around then hardly noticed. A twelve-year period of more-or-less continuous lowering of Denny Hill began on First Avenue north of Pike with a regrade in 1898. 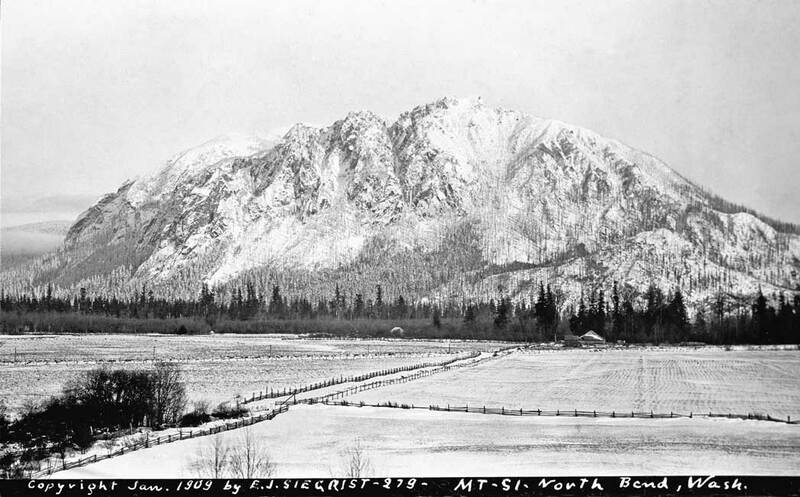 Another excitement of the year was the continuing of the Alaska gold rush, and to serve its winners the opening on First Hill of an official Federal Assay Office. 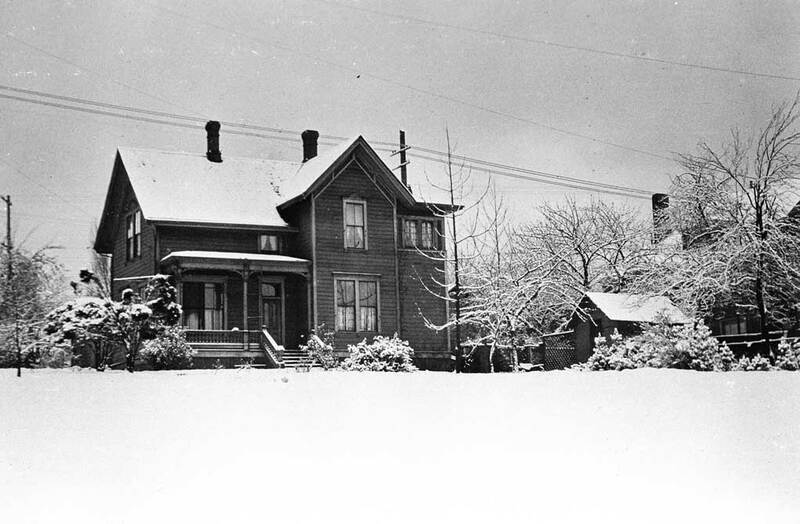 More than five inches covered Seattle on March 11, 1903. It was a March record, which held for many years and may still. That spring the city’s streetcar works struck against the Seattle Traction Company, and the majestic Denny Hotel looming over the city from the south hump of Denny Hill opened on May 23 to its first guest, Pres. Theo Roosevelt. The first snow this year fell oddly early on Oct. 18th. 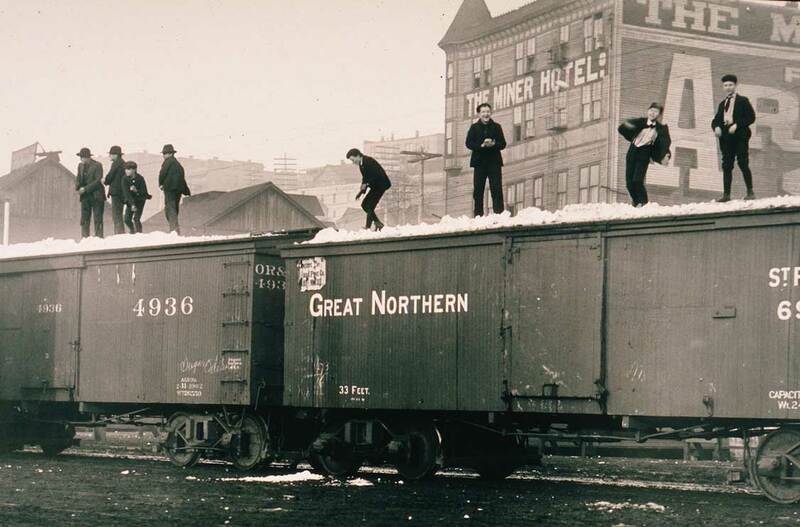 It was the city’s most precocious snow since official reporting began in the winter of 1890/91. This year also the Railroad tunnel beneath the Central Business District opened, and the city’s power plant – the first municipally owned water power electric station in the nation – began generating and sending electricity to the city from its dam at Cedar Lake. 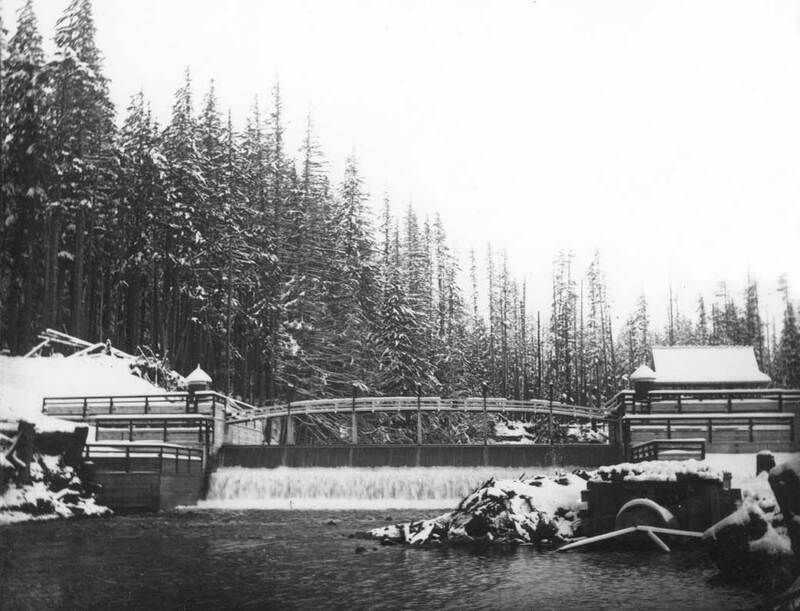 An early photograph (shown here) shows the city’s new dam elegantly outlined by a fresh snow. It was photographed by J.D. Ross’s assistant at the dam, Edward Duffy, who was a Cornell University engineering graduate who knew something Ross did not know – how to wire this new source of power. 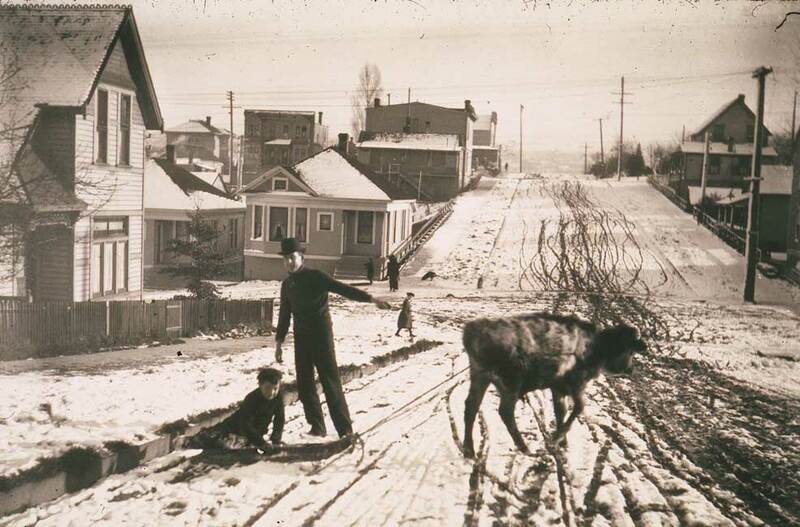 Another photo by Duffy shows a side yard to his parents home on Queen Anne Hill’s Highland Drive with his younger brother Gilbert playing in a snow, which might well be either the early one of 1905 or the miserably cold one of 1907. In January 1907 many locals resorted to “tidying’ the yard and, for that matter, the living room of anything combustible, burning both fences and old furniture in their furnaces and fireplaces. With nearly 200 thousand citizens, Seattle – the Northwest’s best example of a boomtown – had outgrown its services. 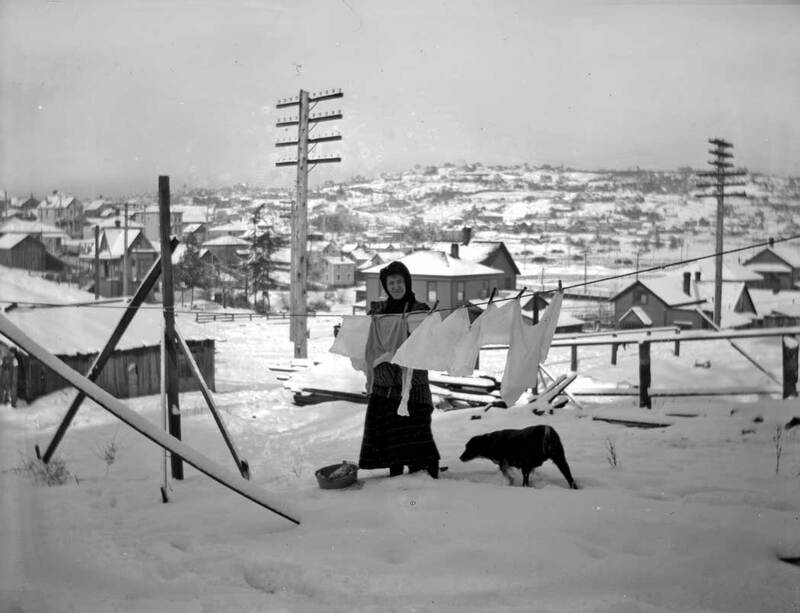 Only a foot of snow fell but with the freeze it was enough to fill hotels with those who could afford such eiderdown relief but could still not purchase fuel for their homes because the city’s cupboard was bare. With the annexation of West Seattle, Ballard and Columbia City, and the opening of the Pike Place Public Market and the Luna Park Amusement Pier at Duwamish Head, 1907 may be considered a bellwether year in Seattle history, and only briefly a bad weather year. Ten years – minus one month – since the temperature dove to 12 degrees in 1899 it reached it again on January 3, 1909. The cold snap, however, barely inhibited the hurried construction on the U.W. 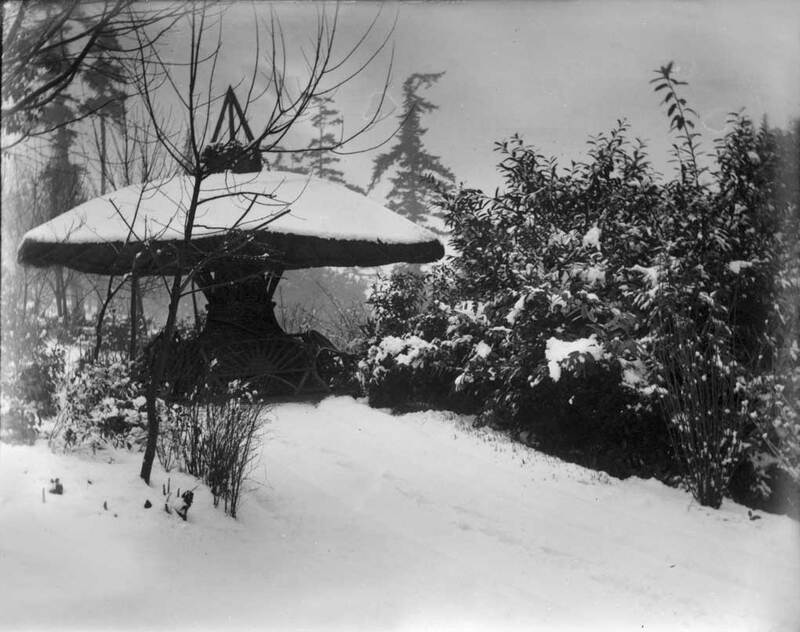 campus of the temporary “white city” designed for the upcoming 1909 Alaska Yukon Pacific Exposition. Weeks after the Expo had completed its showy half-year in October, the temperature fell again. While the mid-December drop was not quite so extreme, and never flirted with zero, it was still both deep and long enough to freeze over Green Lake to skaters’ delight. On Christmas Eve the Park Department determined that the ice was too thin and put a stop to the skating. But the skaters protested in such numbers that the Park Board reconsidered and allowed skating at the south end only where the ice was thickest. In 1909 Green Lake was still the lake left by the last ice age. The tributary from Licton Springs was at its north end, and the outflow to Ravenna Creek and Lake Washington’s Union Bay was its east end. This meant that the lake’s south end was the least disturbed. Two years later in 1911 the lake was lowered seven feet, in order to landscape a lake-wrapping park on the reclaimed shoreline. The lowering, of course, put a stop to the lake’s ancient circulation. The result was the “Green Lake Itch,” although this was never a rash concern in the winter. 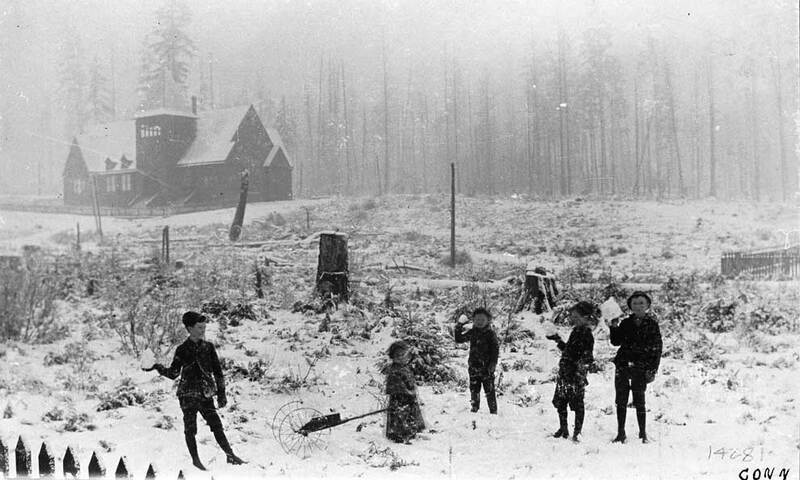 The ease of skating on Christmas Eve 1909 was slowed by the traditional good fortune for Christmas day, as snow fell and covered the city sending a Seattle Times pundit into a reverie for a “beloved white Christmas” as once known in New England. That afternoon in West Seattle a teenage boy while exploring the picturesque woods near his home was suddenly surrounded by barking coyotes. While running home he somehow counted ten in their Yuletide chorus. 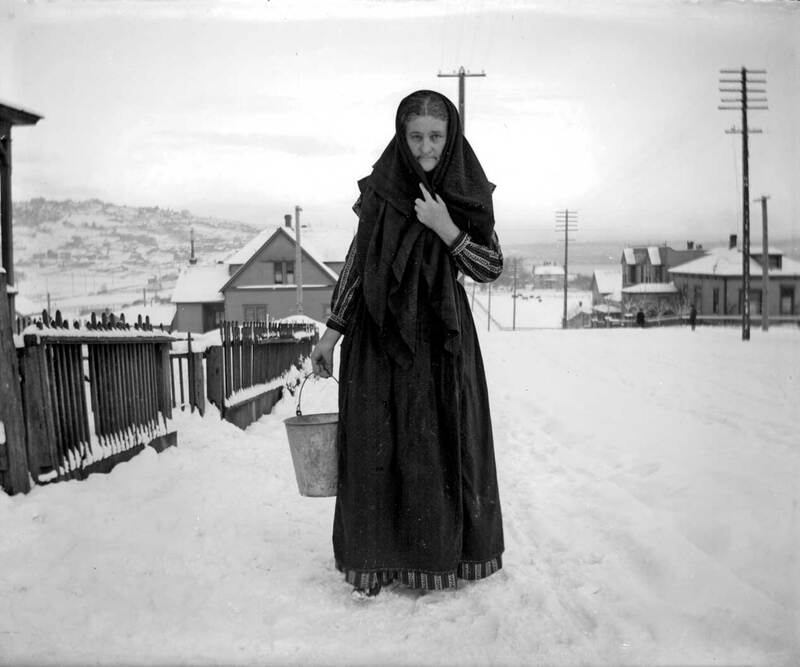 After the generous White Christmas of 1909, 1915 was the next year to join this select group – barely — with a blanket of snow just deep enough to count: a half inch.